It’s tough to out-talk Clayton Patterson, the Bloomberg-bashing photographer with the Santa beard who’s basically the Mayor of the LES. 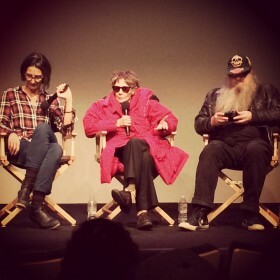 But Jill Freedman managed to do just that following a screening of Everybody Street last night at the Apple Store. The acclaimed photographer, whose black-and-white shots of cops, firemen, and street denizens (many of them from the ’70s and ’80s) appear in Cheryl Dunn‘s excellent new documentary about NYC street shooters, joined Patterson and Dunn in a panel discussion, and immediately stole the show by bitching about the bright stage lighting: “Does Apple sell sunglasses?” she winced. After a pair materialized from the audience (which included East Village rock-and-roll photographer Godlis), she began talking about her subjects (“Crazy people find me, I find them — that’s what I like. The weirder the better”) and eventually, when asked about the ol’ digital-versus-film question (which gets a lot of play in the film) she launched into a mini rant so epic we just have to share it word for word. For any photography students out there. To be afraid of technology is absurd — it’s a tool, like any tool. And like I said, it’s always been the same thing: class, taste, decency. Please don’t bore. And also, if a picture doesn’t have heart, soul, respect… You see people shooting on the street without any respect and it shows, and they’re meaningless. You can’t go around making everybody look like freaks, because people basically are freaks. Everything changes. If you don’t change that means you’re dead, and the city too constantly evolves but never before has there been such a mechanized mindlessness shared by so many. You have all this media coming to you from all over. And then when you think of how many people watch Fox News and what’s going on everyday, it’s kind of horrifying. You couldn’t make this stuff up. I mean, the stupidity is staggering and it seems to be recent and that’s why as far as photography without respect and decency you got nothing. All you got is more Fox News. There’s crazy stuff everywhere. New York is New York, it’s going to come, it’s going to go. We’re not in our 20s anymore — you’re in your 20s, 30s, 40s, whatever, that’s your time, then. You know, it’s all going on and there’s always going to be lunatics out there — all right, now they all look alike and talk alike but you know… well, I don’t approve. You know, they got rid of all the good sleaze on 42nd Street. I was away for a while and when I came back and saw it, it broke my heart, it was the sleaze capital, it was great. Rest assured, Patterson got some words in about the digital-film issue (he shoots digital but worries it isn’t as permanent as film) and the homogenization of the city as well. All these kids are taking pictures with iPhones and cellphones and whatever, so in a lot of ways what we’re doing is no longer that important. I think I kind of caught the end of the photo age in terms of the old school type of photography and I think documenting the Lower East Side like I did, I think I captured the last of the wild and the free, because the Lower East Side has been gentrified – as Ricky Powell talked about so much [Powell complains in the film that the West Village has been taken over by “new jack cornballs”] – that I think it will never be what it was before. All in all, an energetic, moving documentary in the vein of Captured (the great film about Patterson) that reminds us why we live and create in NYC — followed by a slight downer of a q&a. But the good news, as far as the changing city goes: according to the free screening’s host, it was the first of its kind at the Apple store in SoHo, and there’ll be more to come. Maybe they’ll even screen some Times Square sleaze for Freedman?